Three axonometric views above indicate the rather complex arrangement of this project. Blue indicates commercial tenants. Projects like this give some hope for the future of our built environment. 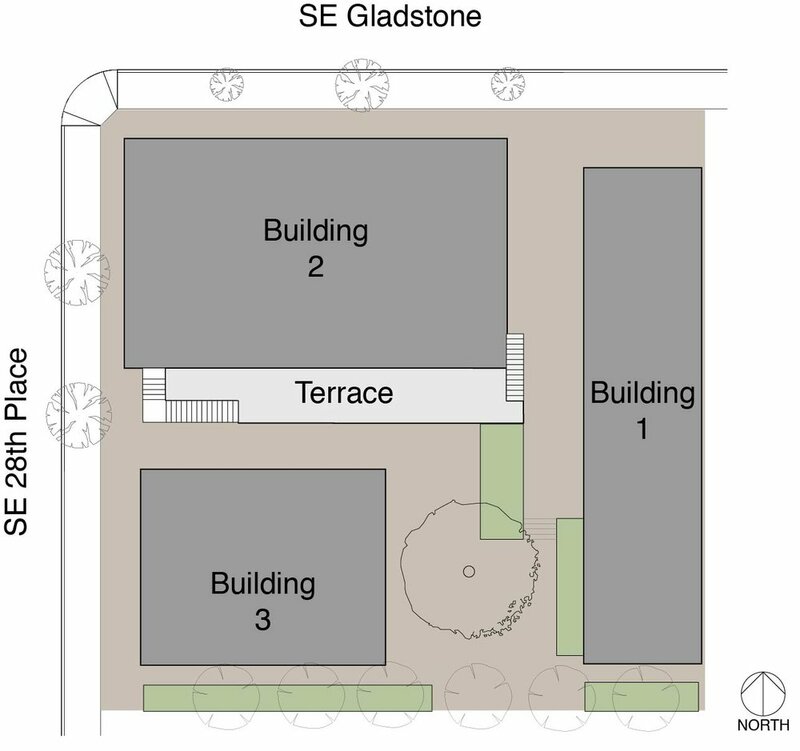 Creston Lofts is a three building mixed-use project in the Creston Kennilworth neighborhood of Southeast Portland, about half a mile north of Reed College. The building is a complex mix of unit types, including studio, 1 bed lofts, two bedroom units and live-work spaces. The project is anchored by the corner building, which features a restaurant on the ground floor. Facing the courtyard is a semi sunken unit with a loft. Steps lead up to a shared deck at the second level, which gives access to three studios and three generous one-bed units. This arrangement resembles dwelling types we’ve seen in Scandinavia on our travels. The Eastern building is a stack of lofted spaces. Two live work units and one lofted one-bed are entered from the ground, and the upper level contains two-story two bed units. These units have their living spaces at the top, to maximize views. The central courtyard is more than a means of access or a leftover negative space between buildings. It is the heart of the project, providing semi private communal open space. A large Japanese maple dominates the space, and given its size and maturity, appears to have been preserved from the site’s previous use as two homes. Obviously, the building’s styling will have some fans and some detractors, but regardless of how one feels about the visual composition, one could hardly find a more carefully crafted, human scaled project, blending different kinds of living spaces with places for small businesses. The small scale of the buildings is eminently appropriate for the context; its buildings are slightly larger in scale than the homes to the south, as is appropriate on minor neighborhood business corridors. A frequent complaint about new development stems from the major scalar shift between existing fabric and the new addition. This project’s scale is only one order of magnitude larger than its neighbors, not several as is sometimes the case. 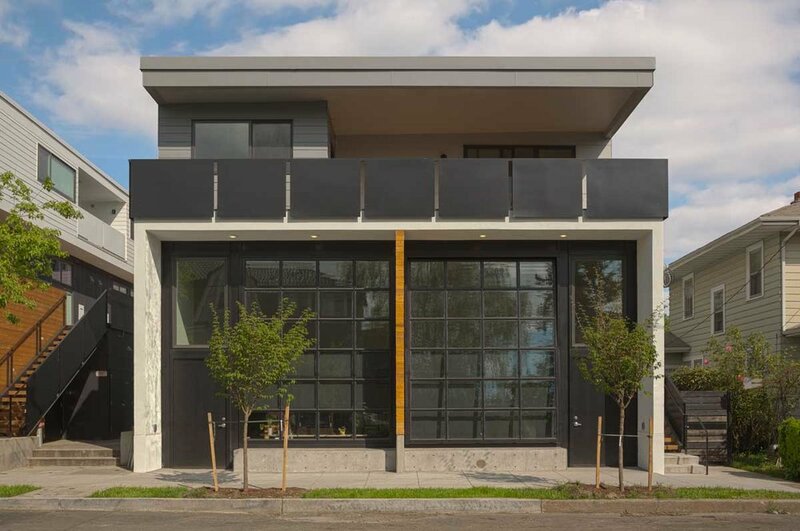 We believe adding buildings like this are a much better way to add density in our established neighborhoods. The multiple building masses and shared spaces blend the best features of contemporary Scandinavian housing design with the intimate scale of a medieval Roman neighborhood. Given the exceptionally innovative design of this project, Plan Design Xplore reached out to the project’s creator, Architect/Developer Lloyd Russell of San Diego. To learn more, read our interview!